Despite listening almost exclusively to talk radio for the past two decades, I've managed to amass an almost encyclopedic knowledge of popular music from the 70s to the present day. Freshplanet's Song Pop has me testing that knowledge against Facebook friends at a disturbing rate. When I was younger I knew a great many things about a wide range of subjects. These days my areas of expertise have narrowed down to two categories — music and geekery (with a major in gaming). So when the opportunity arises to present my accumulated knowledge in a competitive fashion, I attack with the ferocity of a man who knows it won't be long before he starts forgetting things. My dalliance with Song Pop began innocently enough. In an effort to prepare for more comprehensive coverage of social games I wandered over to the Facebook App Center to see what was popular. Several of the games there I had already played. Song Pop I had not. The part of me that's up until 2am competing in one last five-song 90's music battle before bed wishes it had stayed that way. Song Pop gives new players an assortment of genres — 80s, 90s, modern hits, modern rap and so on — and pits them against other players in a five question round of name that tune / name that artist. 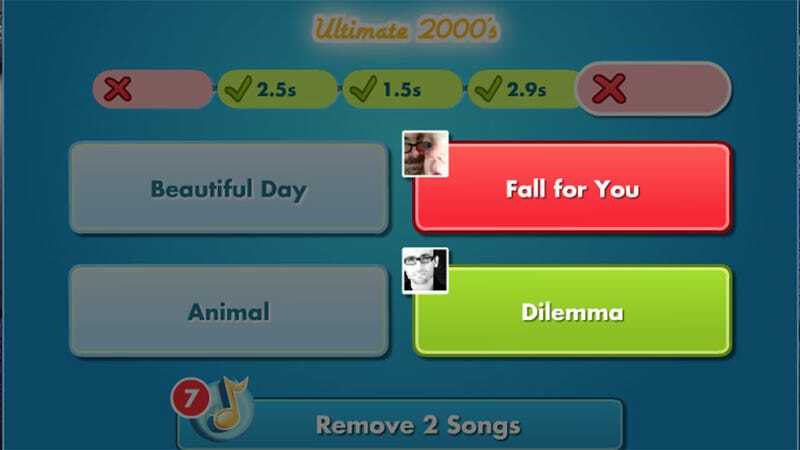 A snippet of a song will play, and the player must choose the correct title or artist from a set of four choices quicker than their opponent does. Winning rounds scores coins, which can be used to unlock advanced genres, including video game music, punk and J-pop. I will not rest until every genre has been unlocked and mastered. Feel free to add me on Facebook at Fahey@Kotaku.com, and I'll see how my knowledge stacks up to yours. And for the sake of my free time, don't let me know that Song Pop is also available to play on iOS and Android.